I am finally here with my Missha X Line Friends Magic Cushion Special Kit review! I spoke about it a little in an empties post back in July when I used up one refill of it; one package of this kit comes with two refills so I am currently going through the second one. I got it off Qoo10 for about S$25 for the whole kit, which is a really affordable price. To be honest, I got it because of how adorable the packaging is. I’m not familiar with Line; I only know it’s supposed to be a messaging app with these cute characters. I like the brown one so that’s how I selected this. It also doesn’t hurt that it’s from Missha, a well known brand – one with a reputation of being a good copy-cat of expensive skincare brands. Besides being incredibly adorable, the packaging is also very user-friendly. It’s very easy to replace the refills – just push up on the bottom and the refill will pop out, then just push down the refill in the space. There’s also a cover that fits over the cushion, which helps keeps in the moisture, with a space on top for the blue puff included. The puffs are supposed to be special – with “air in puff” to help product adhere lightly to the skin without leaving a cake-y look. I think it’s actually true – I do find using the included puff gives a better finish than if I tried using other puffs. 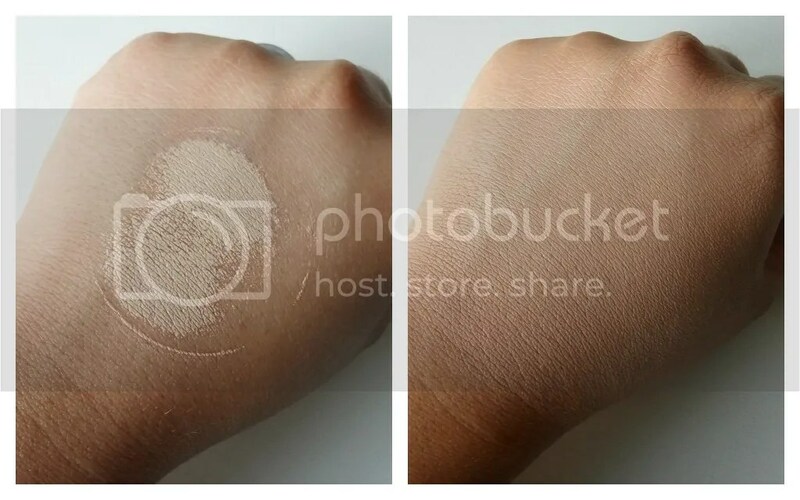 Instead of swiping the puff, you’re supposed to do stamping actions on the face when applying the foundation. 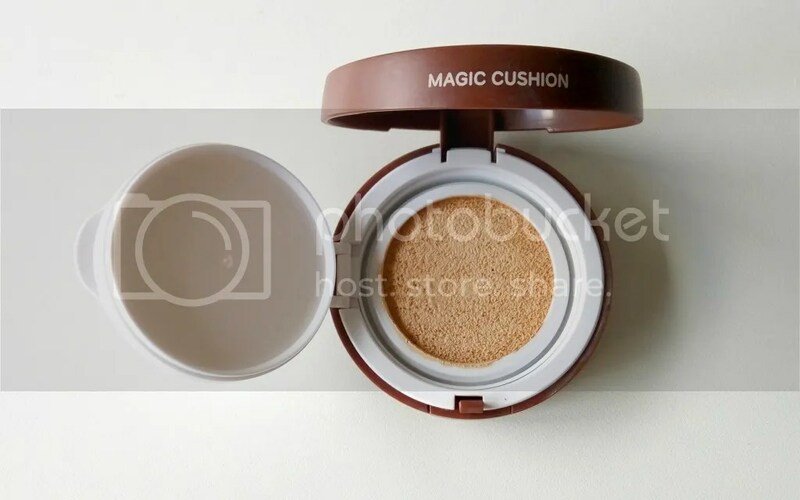 The cushion itself is wonderful – it does a great job at covering up slight pigmentation on the skin. The coverage is light to medium, but it’s very easy to build up to medium coverage. I still have to use concealer for areas with big pimples, but I don’t find a need for concealer under the eye with this. Using a puff also makes the job much quicker and easier. The finish is dewy; it can feel thicker than liquid foundation and looks rather glossy so this might not be for everyone, but for dry skin ladies like me it makes my skin look really fresh and luminous. I tend not to powder too much when I use this because I love how dewy this makes my skin look, without being overly oily looking. It also dries down rather fast. It doesn’t last as long as my usual liquid foundation, about 6-8 hours, but I think it’s also because I don’t like using setting powder over such a dewy product so as to maintain its dewiness. Also, by nature of being dewy, there’s a lot more slip in the product than matte foundations, so it’s easier to rub off. But that’s just my own conjecture. 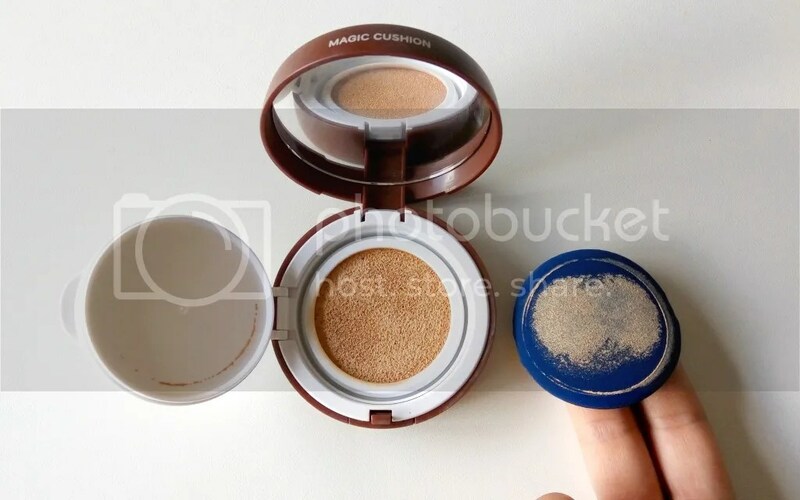 In all, I love this cushion foundation! It’s really affordable, if you can get your hands on one from Qoo10, and the quality is great. Plus, how could you say no to such a cute case?